Why opt for an ionic brush? Find out the benefits of using an ionic brush as opposed to a standard hairbrush. You may have already heard of this "magic" brush which makes your hair shiny and neutralises static electricity. But how does it work, and what are the other benefits of using it? The ionic brush is a battery powered accessory which acts in the same way as a hair repair treatment. 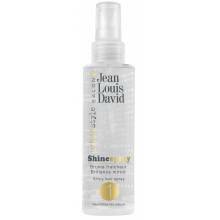 Its three main assets are that it straightens, cares for and adds shine to your hair. But how does it work? It re-balances your hair's static electricity levels by releasing negative ions to neutralise the positive ions naturally found on your hair. These positive ions contribute to weakening the hair fibre. This means that the ionic technology built into the brush allows you to limit the amount of split ends and frizz in your hair. It also makes detangling easier. These properties make this brush an invaluable aid for dry and damaged hair. For example, fans of straightening can go easy on their locks by using the ionic brush before blow-drying, preventing their hair from getting damaged by excessively pulling on it. You can use the ionic brush on a daily basis. It is equally as effective in summer, when hair dries out more easily and your locks are lacklustre, as in winter, when your hair is subject to static electricity due to rapid changes in temperature. Like with a standard brush, it is advisable to use the ionic brush on slightly damp hair, before blow-drying. You can also use the brush for touch-ups during the day on dry hair. When the indicator lights up it means the ions are charged. Then all you need to do is brush your hair normally for shiny, tamed straightened locks. The effects of the ionic brush wear off after three hours and it is hard to pop it into your handbag due to its size. This makes touch-ups throughout the day much more difficult. So consider leaving it at the office, in your special hair styling kit!